Celtic have called for an end to the use of flares among their supporters after they were fined more than £10,000 following their latest Uefa charge. The Scottish champions were punished after fans set off fireworks during their Europa League draw against Fenerbahce in Turkey and for “improper conduct of the team”. The latter charge is automatically triggered when a team receives five yellow cards in a European match, which happened to Celtic during the 1-1 draw on 10 December. Dedryck Boyata, Mikael Lustig, Stefan Johansen, Jozo Simunovic and Kieran Tierney were all booked in Istanbul. Uefa announced the €13,000 punishment following a meeting of their control, ethics and disciplinary body. 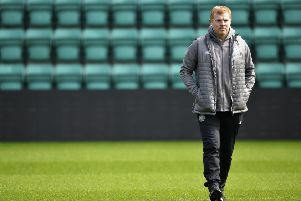 Celtic responded to the fine with a statement which read: “Celtic supporters travel in their thousands to European matches and the club is always grateful and proud to have such a magnificent following from fans who have earned a wonderful reputation. “Backed by our supporters’ groups, the club has repeatedly stated its strong opposition to the use of pyrotechnics and took the appropriate action following this match in relation to the individuals concerned. Celtic issued indefinite bans to two supporters following the Fenerbahce incidents in Turkey and revealed in December that they were considering legal action against individual fans. Celtic were hit with a €10,000 fine for an identical charge sheet following their defeat by Inter Milan in Italy earlier in 2015 and the latest case was the eighth time in five seasons that they have been punished by the European governing body for supporter misconduct. Included in these misdemeanours were fines for other pyrotechnic offences. In 2012 Celtic were fined £21,000 for fans holding a banner criticising Uefa and the use of flares in a Europa League game against the Italian side Udinese. A year later they were fined £4,200 after a firework was let off at Celtic Park during the Champions League qualifier with Northern Irish side Cliftonville.